This large adjustable banner stands make great photographic backgrounds. Great for events and can easily be taken from one event to the next. 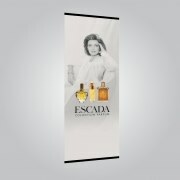 Available as a single- or double-sided display, Banner Bug comes in a range of sizes. 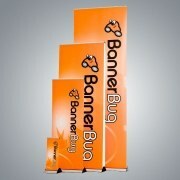 Banner Bug displays are sleek, modern and easy to transport. They roll up in seconds. And when the time comes for new graphics, they're quick and easy to change. The Chrono is a black carbon display available in range of height and width formats in double sided and single-sided models. Mix and match different header and footer widths to create customized banner designs Lightweight, sets up in minutes and ships easily.